This sounds absolutely marvelous! I love the combination of flavors and textures. 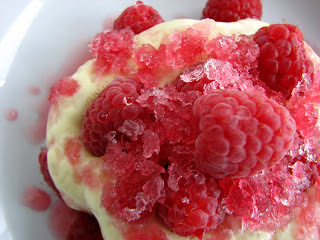 It makes me want to throw a dinner party just for dessert! Beautiful! Very sophisticated too. You should submit this to Recipe4Living.com! That sounds amazing! 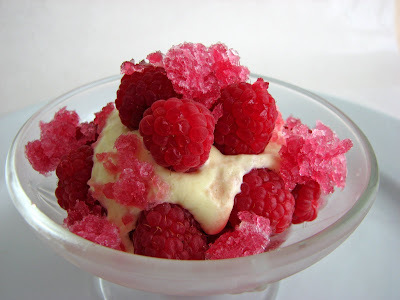 I love hibiscus and its berry-ish flavor so to pair it with raspberries and a fruity sabayon...yum! I really need to order some more hibiscus - especially to make this! What a beautiful and unusual dish! So pretty. 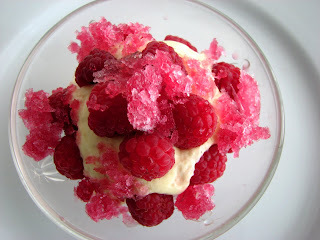 I love the idea of hibiscus granita! I like raspberries are like WOW. A bomb to my mouth.